Does anyone have v4 of Mr. F's .4ds export script for 3DS Max? I think that's the most up-to-date version. Its predecessors seem to export textures in a buggy way.. I do, but I'm still working on it Version 3 is the newest and there are no texture bugs in there. EDIT: Now that I'm thinking about it. It might not export "color key" flag properly. I'll have to check it. That's interesting I'm getting lots of textures swapped around - I'm having to correct them with Djbozkosz's 4DS Manager. Swapped textures will happen if you delete all faces of an particular texture from a mesh that has multi-material assigned (holds multiple textures) which would result in skipping some textures (red circle, 5 textures used, 1st one skipped, will result in an error). 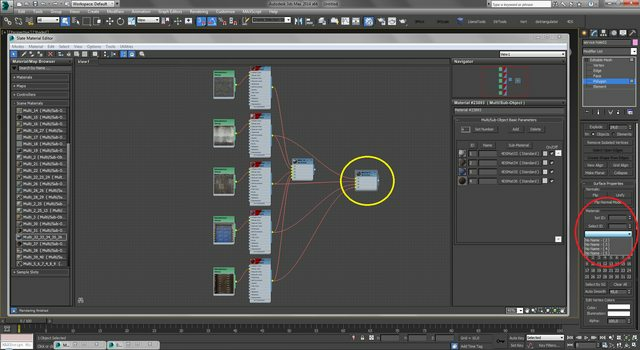 To fix this you can create new multi-material (yellow circle), assign textures skipping 1st one, assign material to mesh and adjust face texture IDs. I considered it rather as an user error than exporter one but I looked into script and updated it to take that into account during exporting. I have to test it a bit but it seems that this won't be an issue in the new version anymore. Ah, yeah definitely human error - thanks for clearing that up! That would explain why it tends to happen when editing existing game models. You mean slots from multi-material? If so click on "Set Number" button right from yellow circle. Export does have a few errors. Need to download the latest Boz4dsfullmanager there to see. Marked in red, an empty material is created. Marked blue, the effect flag is off, but color key is on and works in the game. Boz4dsfullmanager is well suited to compare the original with the re-export model and identify errors. Yes, I wrote earlier that there might be something wrong with flags. It's fixed now. I've also fixed an importer error - it actually didn't import custom Mafia material but the default one. Flags can be now properly imported and stored. Also, materials are now consolidated during import. So I rebuilt the texture tree in the slate editor and it looked fine upon export. But sometime later, when I edited the mesh and exported it with the script, I got this..
Welp errors are bound to happen sometimes. Doesn't seem like an exporter error. Did you overwrite an object that had lightmap created or face collision assigned to it in the scene? This would generate this kind of error since you're changing structure of an object. If not, does it look like this in Max viewport after importing again? Ah you were right, an existing lightmap was the issue. I had no idea it could cause such a bizarre geometry effect..